Dirk Bogarde (in mirror) and James Fox in Joseph Losey's THE SERVANT (1963). 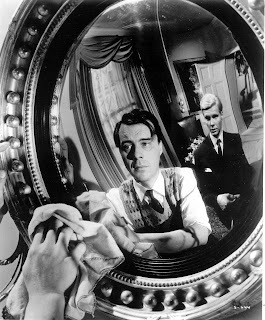 Now showing at Film Forum in NYC for its 50th Anniversary in a beautiful restored print, Joseph Losey's The Servant is a wickedly smart and perfectly outrageous film about a rich man (James Fox) who hires a manservant (Dirk Bogarde) to serve him. However, the servant has an agenda. The Servant defies being placed in a single genre. Is it a drama? Yes. Comedy? Yes, and a very dark one. Surreal thriller? Yes, in a way. The film was written by acclaimed screenwriter and playwright Harold Pinter. Realizing the outrageous potential in a film like this, Pinter gives the film a genre change about half-way or three-quarters of the way through that makes the film interesting and bizarre. With this film, Pinter and crew explore class. The film shows that class is just a label. Classes can be manipulated and in this film about power and its relationship to class, they are. Even with all of the genre changes, the film's tonal balance never feels off. The comedy is hilarious and dark, the drama is smart and, at times, powerful, and the thriller aspects are bizarrely wonderful. Dirk Bogarde and James Fox's performances are stellar and adapt to each tonal shift. Bogarde stands out above all others, though. He is very believable, likable, despicable, and campy. The campy aspects fit the film perfectly. Bogarde never overdoes it, but still manages to chew the scenery. The scenery-chewing fits his character. Bogarde is in his element. Before seeing The Servant tonight, I had never seen it, and I first heard of it just last week when at Film Forum. Knowing nothing about it, I went in blind and what I got was a huge surprise. No way could I have ever expected a film so smart and intellectual, yet so entertaining. This movie works on so many levels and is quite the achievement. The first half does have a few slower spots, but these build to the second half which must be seen to be believed. Overall, The Servant is a near-masterpiece that should be viewed immediately. Now that I have put it on your radar (if it wasn't before), you have no excuse not to watch it. I'd recommend going to Film Forum if you live in or near NYC because their restored print is nearly flawless. It is crisp and clean and really makes the film look as good as possible.